My love for Wee Care is well known. It holds a very special place in my heart, almost more than I can articulate. I have had many say to me, "Oh I can't do Wee Care. It is too sad." I am not judging anyone, we all have to do what is best for us. 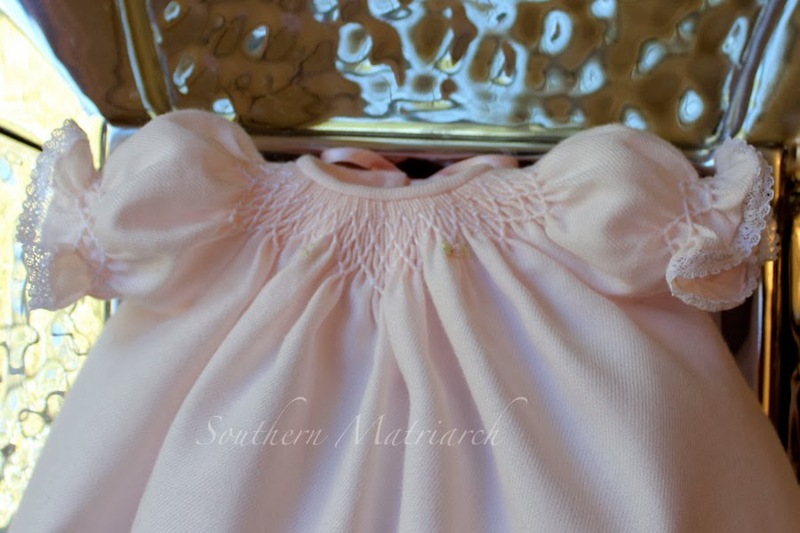 That said, I admit that I never fail to think when hearing that: "Not near as sad as it is for those parents" Also, every baby deserves the love and dignity that these precious gowns offer. Which brings us to this post. I was talking with my daughter for her birthday when she asked if I had any Wee Care gowns on hand. A friend of a friend needed one and quickly. 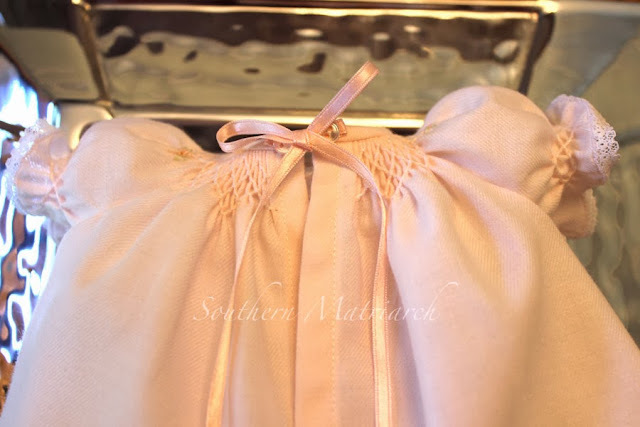 I stopped everything I was doing to stitch this tiny pink gown. A prayer in every stitch. I chose a luxurious Swiss flannel in a soft pink. 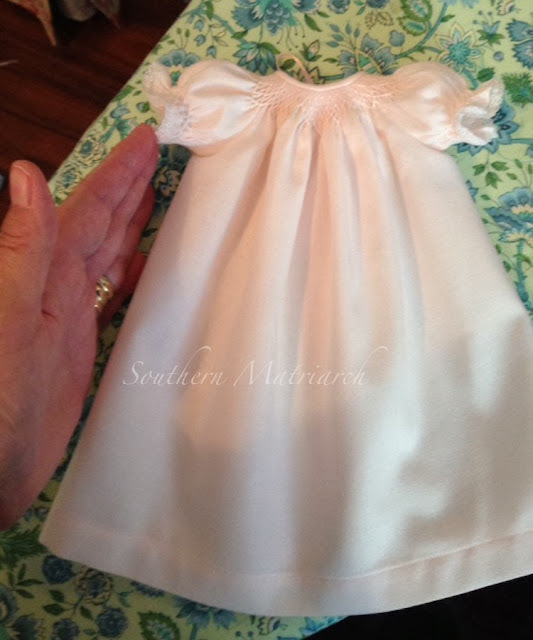 The sleeves are trimmed with tiny 1/4" French lace to make this tiny, 8.5" gown. There are also free Wee Care patterns available on SAGA's website. 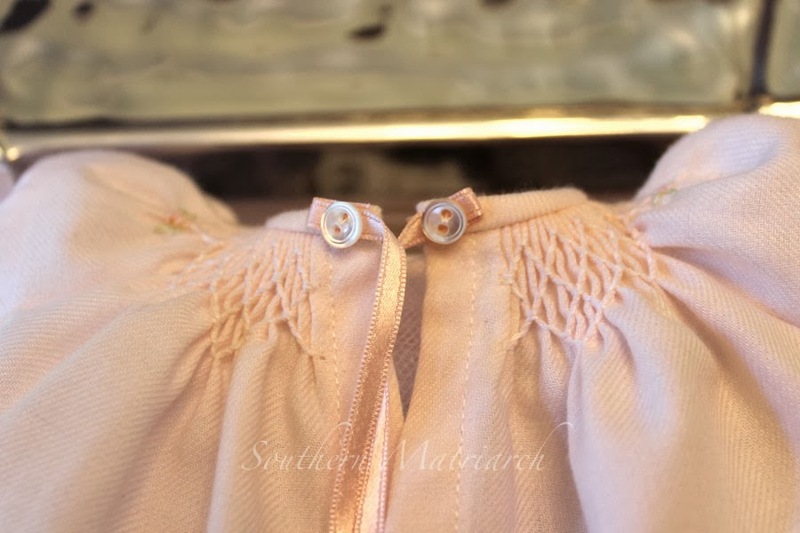 I attached the silk satin ribbon with tiny antique buttons from Old Fashioned Baby. It is smocked with two strands of floss. It is bound at the neck with a 1/8" bias neckband. There are also the teeniest one strand bullion flowers that you can't see very well. Since I was mailing this overnight, I stuffed it well with tulle and wrapped the stuffed gown with a cut-up dry cleaner bag to prevent as much wrinkling as possible. Though Swiss flannel is forgiving as far as wrinkles go. I was even able to find a box that I could lay the gown flat, not folded, for mailing. This gown will never replace the life that was lost, but I pray that it brings the parents a tiny bit of comfort. If you are able, never pass up the opportunity to stitch a Wee Care gown. You will never know the impact it can have. The gown is just beautiful and will be treasured. Prayers have been added to yours for this family. 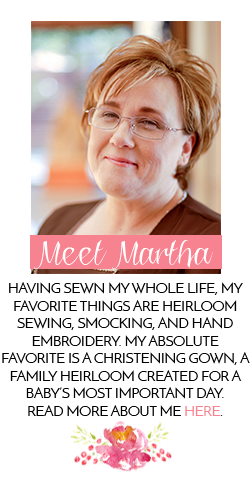 Oh Martha, your words are so true. It doesn't take away the grief that the parents go through but it goes such a long way in providing comfort. More than any word could ever do. And I love how you made this gown so special, and so pretty. You have just made the ONLY gown this baby will ever wear. Clothed in love and prayers - fit for a beloved Baby. I am thankful that you do this. I agree with you completely regarding the attitudes of the people who walk away from these situations. My sister died and my mother never got over it. I have met another mother who took it even worse. The grief at such times is ghastly. Wee Care gowns are marvellous not only for the child but for the entire family. The same is true for the Quilts of Love used for burials. The robe you made is wonderful. In a few months there will be few people who can see how carefully you stitched this, but your heart and soul will know. To do this for a complete stranger says much about your character. Such a beautiful little gown. 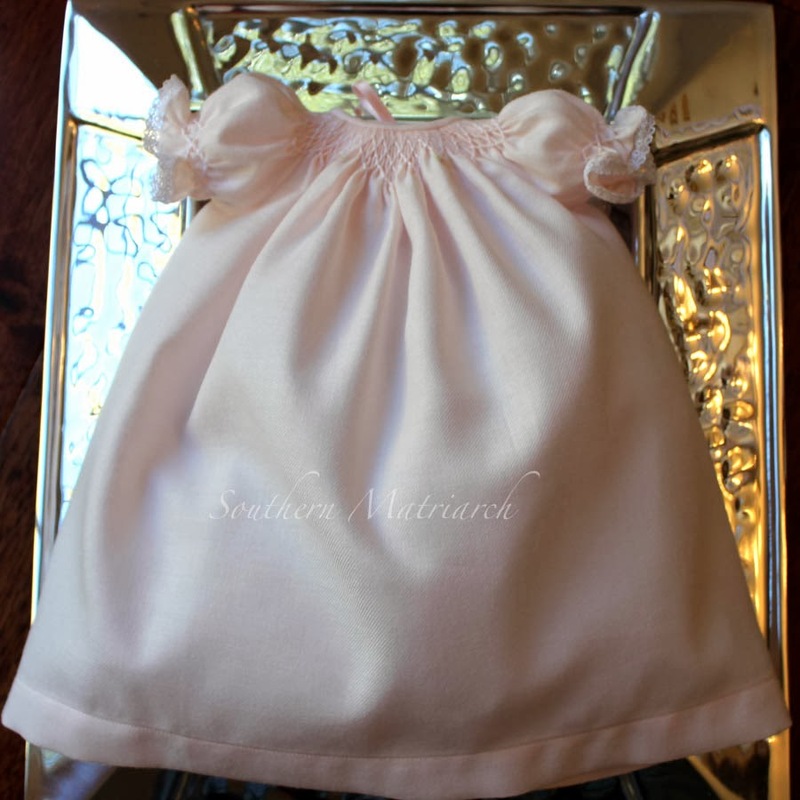 I am sure the parents appreciate all the love that went into this gown for their little one. Thanks for your kindness. God bless. That gown is beautiful!! I totally agree with your sentiments. Jeannie B got me into Threads of Love after one of her blog posts. It just tugged at my heart. Sissy Davis tells us "we are gift wrapping these angels for Jesus!" I hope your post tugs at someone else's heart. makes me want to take every stitch with extra care and prayer.